It can be really difficult to find people that perfect gift at Christmas, especially if you are buying for a lot of people, which is why I regularly resort to the thing I do best; something edible! Giving a handmade gift is both thoughtful and cost-effective, and definitely won’t be something they have already. Whether you whip up a stack of cookies, a batch of festive fudge, or my most recent favourite: a whole cake. A whole iced cake in a pretty tin makes a perfect gift. Choose a cake recipe that will stay fresh for a week or so (a ginger cake or fruitcake is perfect) rather than a light sponge that will dry out, as this gives the lucky recipient enough time to enjoy it. I love these Dahlia themed tins from Laura Ashley’s Christmas collection with their golden lids – they look fantastic stocked full of cake and tied with a bow to give away (or keep for yourself!). Their cake forks and cake slicer are also gorgeous, with porcelain handles that match the tin. My recipe of choice this year is my spiced honey and milk cake. It is really simple to make, keeps everyone from the youngest to the oldest happy and keeps for 1-2 weeks when stored correctly, which is ideal gift-giving territory. I’ve thrown on a few festive sprinkles, but you can decorate with whatever you like – a sprinkle of cinnamon works beautifully! 1. Preheat the oven to 180oC/160oC fan/gas mark 4 and grease and line a 20cm round cake tin with baking parchment. 2. Melt the butter, sugar and honey together in a large saucepan over a low heat until the mixture no longer feels grainy and the butter has completley melted. Remove from the heat and allow to cool slightly whilst you continue the recipe. 3. Combine the flour, baking powder, bicarbonate of soda and spices in a small bowl. Stir the milk into the butter mixture, then beat in both of the eggs. Whisk in the dry ingredients until a smooth batter forms, then pour the mixture into the prepared tin. 4. Bake the cake for 30-35 minutes, or until the top of the cake is firm and a skewer inserted has a few sticky crumbs and no raw batter on it. Allow the cake to cool for 5 minutes in the tin. 5. Mix together the icing sugar with the milk and honey to make a thick icing. Pour over the hot cake and then sprinkle the top of the cake with a few Christmas sprinkles. This cake is delicious served warm, or will keep for up to two weeks in a sealed container. Recipe adapted from Crave, available on Amazon or high-street book shops. Blog post written in partnership with Laura Ashley. Growing up, Lyle's Golden Syrup loaf cake was up there with my favourite cakes you could buy. Always moist, sticky and sweet with a tacky top that I couldn’t get enough of. Lyle's Golden Syrup is a sacred British ingredient, the glue that holds together lots of our classic bakes. If you’re not lucky enough to live in the U.K. and have unlimited access to this golden elixir, be sure to fill your suitcase when you head back after your visit. Honeycomb is an impressive decoration that is surprisingly easy (and pretty magical!) to make. Lyle's Golden Syrup is a key ingredient for making good honeycomb, as the structure of the sugar syrup helps to stabilise the honeycomb mixture. It only takes a few minutes to make, and seeing it come to life and the shattering it into shards is lots of fun. This cake keeps well for around a week but the honeycomb may begin to dissolve if kept in a humid environment, so eat as quickly as you can after decorating. 1. Preheat the oven to 160˚C. Line a 2lb loaf tin with baking parchment. 2. Place the butter, syrup and sugars into a medium pan and heat gently until the ingredients are just melted together, stirring occasionally. Once melted together, set aside and allow to cool for at least 10 minutes. 3. In a small jug, beat the milk and egg together, then add to the cooled syrup mixture. Combine the flour and baking powder in a large bowl. 4. Pour the wet ingredients into the dry and use a balloon whisk to beat, making sure there are no large lumps. 5. Divide the mixture between two bowls. Sift the cocoa into one bowl of mixture and fold in. 6. Dollop the mixture into the tin in large spoonfuls, alternating between the chocolate and syrup mixtures. 7. Bake for 40-45 minutes, until the cake is well risen and a skewer inserted comes out clean. Allow to cool completely before decorating. 8. To make the honeycomb, place the sugar and golden syrup into a medium sized saucepan. Boil until it turns a dark golden colour, then remove from the heat and quickly whisk in the bicarbonate of soda. The mixture will froth up and is extremely hot, so be careful. Pour out onto a piece of baking parchment and leave to harden before breaking into shards. 9. To make the chocolate icing, place the icing sugar, cocoa and water in a bowl and stir until smooth. Drizzle over the cooled cake, then sprinkle the honeycomb on top. Spring is peeking out from behind the clouds and I couldn't be more ready! It's this point of the year that I attempt a quick spring clean, and discover any ingredients lurking at the back of my cupboard that haven't been used since Christmas. Mixed peel is one such ingredients. It seems to go into every single festive recipe, yet is left redundant for the 11 months that follow, and will likely have dried out my the time you next come to use it! It sounds a rather ordinary ingredient, but weaving it into the batter of this polenta cake transforms the small pieces of leathery peel into chewy nuggets of citrus flavour, almost like sweets. To me, cakes fall into two categories. You’ve got your light-as-air, tea-and-cake style numbers, often dainty and delicate, and then you’ve got dessert cake. Dessert cake should be a different encounter: dense, eaten with a spoon and suitable to drench in cream or custard. A polenta cake is all these things – being beautifully stodgy and sticky, but matching it with orange and lemon makes it light and moreish at the same time. My version is topped off with cheats candied peel – tubs of shop-bought peel tossed in chunky pieces of sugar. 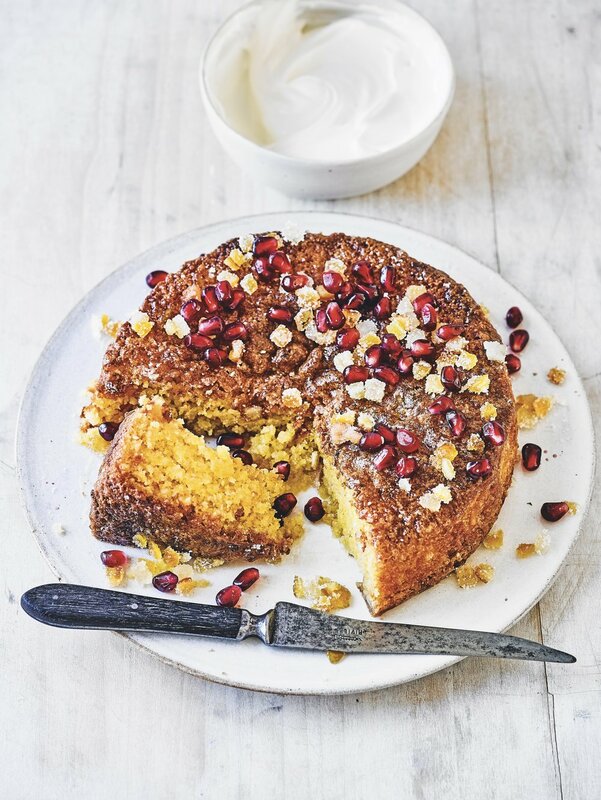 A perfect dessert for me is a generous slice of this cake with a dollop of Greek yoghurt on the side and a scattering of pomegranate seeds or fresh raspberries – an indulgent yet refreshing end to a meal. Give it a try and let me know how you get on! 1. Preheat the oven to 170°C, gas mark 3. Grease and line the base and sides of a 20cm loose-bottomed tin with baking parchment. 2. Cream together the butter and sugar using an electric hand whisk until light and fluffy. Add the eggs one at a time, beating well between each addition. Stir in the dry ingredients and beat until smooth, then fold in the orange zest and mixed peel. 3. Scrape the batter into the prepared tin and level the surface, place on a baking tray. Bake for 50-55 minutes until risen and fairly firm (it will have a very slight wobble in the middle). Test the cake using a skewer – it should come out clean when inserted into the centre. 4. While the cake is baking, make the orange syrup. Place the sugar and juice of the orange into a small saucepan and bring to the boil. Allow to simmer for 1 minute, then remove from the heat. When the cake is baked, remove from the oven and, while still hot, brush the warm syrup all over it, then leave to cool completely on a wire rack. The cake may sink slightly in the centre, but this is normal for polenta cakes. 5. To finish, make the sugared peel by shaking together the candied mixed peel and granulated sugar in a sealed ziplock bag until well coated. Sprinkle over the top of the cake, then serve generous slices as a delicious dessert. Something that might surprise a few of you: there is only one food I won’t eat. Bananas. Ever since I was a young child, they are the only food my body can’t handle. I’ve tried many a time to rekindle our relationship, attempting to eat bananas in many guises, but it never worked. Banana bread, however, I’ve always admired and longed to enjoy. Soft, squidgy and sweet, it’s all the things I love, so I was determined to find a way to make a loaf that I love. It goes without saying that peanut butter makes everything better, so incorporating spoonfuls into my batter, which I make by sautéing the bananas in butter and sugar to caramelise and soften them, was always going to be a hit. I didn’t quite realise how much of a hit though; I was thrilled that I’d made a loaf including banana that I actually enjoyed eating, but my housemates RAVED about this cake. It’s moist and sticky, buttery and chocolatey with notes of caramel running through the whole thing. 1. Preheat the oven to 170oC/150oC fan/gas mark 3 and grease and line the base and sides of a 9 x 5 inch 1l loaf tin with baking parchment. 2. Slice two bananas into small discs and sauté with 25g of the butter and the brown sugar for 4-5 minutes until the bananas are starting to soften. Remove from the heat and mash with a fork or potato masher until the mixture is mostly smooth with just a few lumps of banana – they should disintegrate fairly quickly. Stir the remaining butter and peanut butter into the warm mashed banana and allow it to melt. 3. Mix the flour and baking powder together in a large bowl. Pour the milk into the mashed banana mixture and stir to combine, followed by the eggs. Pour the wet ingredients into the dry ingredients and beat until the mixture is smooth and no lumps of flour remain. Don’t overbeat the mixture at this stage, or the resulting banana bread will be tough. Add the chocolate chunks and peanuts, then scrape the batter into the prepared tin and smooth over the top. 4. Slice the remaining banana in half and place on the top of the cake. Bake the cake for 45-50 minutes, or until the cake is risen and golden and a skewer comes out clean. Allow to cool for 5 minutes in the tin, then transfer to a cooling rack to cool completely. Halloween has now come and gone and left behind a glut of pumpkins that no one seems to know what to do with! 18,000 tonnes of pumpkin are thrown away each year, which is such a crime as pumpkins are delicious in both sweet and savoury form. My pumpkin spice cake is one of my autumnal go-to recipes. It's an easy, one-bowl recipe and has all the flavour of a carrot cake without you going to the trouble of grating carrots (one of my baking pet-hates, along with lining tins..). Coincidently, this cake is made in a bundt tin that doesn't need lining with paper, so this might be one of the most low-maintenance cakes ever. To make pumpkin puree from scratch, simply boil or steam peeled chunks of pumpkin until tender, then blend to a puree. Simple! You'll probably have lots more than you'll need for this cake, but try a soup recipes (this one works well with pumpkin) or mix some of the puree into cheese sauce for mac and cheese - works a dream! I also love chunks of pumpkin stirred into curries or roasted in oil and salt as a great potato alternative. This is a recipe from Twist that I recreated for Tastemade UK. 1. Preheat the oven to 160oC and prepare a 1.5l bundt tin by greasing well with butter and flouring lightly. As this cake has a high sugar content, it is more likely to caramelise and stick to the tin, so the layer of flour helps prevent this. 2. In a large mixing bowl, beat together the pumpkin puree, eggs, oil, milk and both sugars until they are well blended. 3. Using another bowl, combine the flour, bicarbonate of soda, salt and spices. Fold the dry ingredients into the wet ingredients and mix until smooth, with no large lumps of flour remaining. 4. Pour into the prepared tin and bake for 50 minutes, or until a skewer inserted comes out clean. Leave the cake to cool for 10-15 minutes, or until the pan is cool enough to touch. Use a plastic spatula or knife and run it around the edges of the tin if the cake looks like it might be stuck. Invert onto a cooling rack and leave to cool completely before decorating. 5. For the topping, mix the icing sugar with a tablespoon of water to make a thick paste. Pipe a thick ring around the top of the cold bundt, then tap the rack firmly on the work surface to encourage it to start spreading and to drip down the edges. Dust with a little nutmeg and cinnamon before moving to a cake stand or large plate to serve. This cake will keep for 5-6 days and still be beautifully moist. Why have a cup of tea and a slice of cake when you can have both together? Aromatic earl grey is infused into every area of this cake. It elevates an often bold and brash slab of cake into something delicate and refined, with the tea creating a refreshing backdrop. 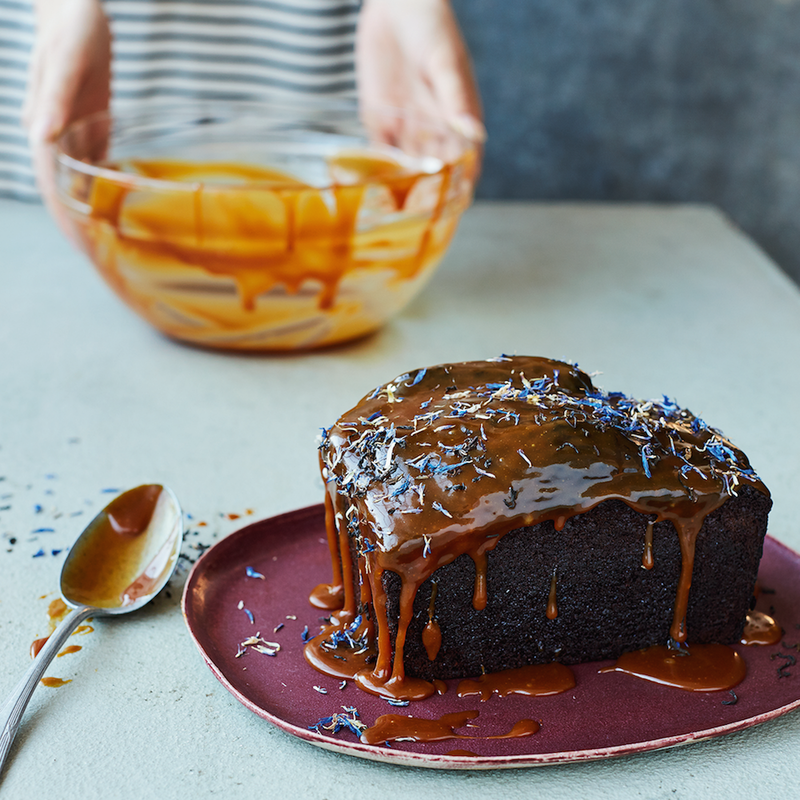 I like to sprinkle loose-leaf tea over the top of the cake as the vibrant blue cornflowers’ pop against the creamy caramel. 1. Preheat the oven to 180oC/160oC fan/gas mark 4 and grease and line a loaf tin with baking parchment. 2. Place the Earl Grey teabags into a mug or small jug and pour the boiling water over the top. Allow to brew for 5 minutes. 3. Whilst the tea is brewing, stir together the plain flour, sugars, cocoa powder and bicarbonate of soda in a large bowl. 4. Melt the butter in the microwave or in a small saucepan and discard the teabags from the tea. Whisk the butter, yoghurt, eggs and tea together. 5. Pour the wet mixture into the dry ingredients, whisking until a smooth batter has formed. It will be fairly runny but this is normal. Scrape the batter into the loaf tin and bake for 35-40 minutes or until risen, and a skewer inserted should come out clean. 6. Whilst the cake is baking, gently heat the cream in a small saucepan with the earl grey teabag until the cream is steaming and slightly coloured by the tea. Pour into a small jug and set to one side to infuse for 5 minutes, then squeeze out the teabag and discard. 7. Place the sugar and water together in a heavy-bottomed saucepan and stir briefly to combine. Set over a medium heat and allow the mixture to bubble and turn golden brown in colour. Try not to stir the mixture while it caramelises or the sugar might crystallise – swirl the pan occasionally instead if the caramel is colouring unevenly. 8. When the sugar reaches a dark amber colour and starts to smell caramelised, remove from the heat and stir in the butter. The mixture will splutter and bubble, so be careful when adding it in. Pour in the infused double cream slowly, stirring as you add it. Return the mixture to the heat for 1 minute, then stir in the sea salt. Allow the caramel to cool slightly and taste it to see if you need to add any more salt. 9. Allow the cake to cool for 10 minutes in the tin, then carefully remove and transfer to a cooling rack. Pour over the caramel sauce and leave to set briefly before sprinkling with loose leaf earl grey, slicing and enjoying. Summer has finally arrived and brought with it the incessant desire to be both outside enjoying the sun and to be baking using fresh, summery ingredients. It's a tough life, really, it is. Red berries are the jewels of the season and look and taste stunning when treated properly. The are the substance and adornment of this loaf cake, paired with a tangy yogurt sponge and icing. The form of this cake was a happy accident. I tried painfully to make it work as a bundt cake, but the tender sponge and sticky berries gave me trial after trial of half-stuck cakes with no success. My solution was to loaf it up, and I love the new appearance with a cascade of berries down the centre. Adding acidic yogurt to cake batter makes the sponge soft and tender - perfect for a light treat on hot days. 1. Preheat the oven to 180°C, gas mark 4 and grease and line a 900g loaf tin with baking parchment. In a large mixing bowl, beat together the oil, eggs, yogurt and caster sugar until they form a smooth paste. Sieve over the flour, salt and baking powder and mix until just combined (overbeating will result in a tough sponge). Fold through the frozen berries and spoon into the lined tin. 2. Bake for 50-55 minutes, or until a skewer inserted into the cake comes out clean and it is golden on the top. Allow to cool for 10 minutes in the tin, then turn out and allow to cool completely. 3. To make the yogurt icing, beat the soft butter in a small bowl using an electric whisk until smooth, then add the yogurt and beat again until well combined. Add the icing sugar a little at a time, whisking until thick and fluffy. Chill until ready to use. 4. When the cake is completely cool, use a palette knife to spread the icing onto the top. Sprinkle over the freeze-dried berries and arrange the fresh berries over the top. This cake will keep for up to 3 days in the fridge, but is best eaten straight away. Great gluten-free recipes are like gold dust. I find so many recipes claim to be gluten free, but lack in texture or flavour due to flour substitutes and other additions. Using polenta is a fantastic replacement for flour. It's more than a replacement - it has its own unique flavour and texture which works perfectly. Ground almonds also add structure and a nuttiness. Use any kind of nut you fancy - I've used a mixture of pistachio which lends its vibrant colour to the batter. Also, crystallising nuts is FUN! I experimented with it for the first time for this cake and they are both easy and beautiful - almost sparkling on the top of the cake. It does feel unnatural and slightly wrong to add nuts to syrup and stir until it clumps and becomes dry, but that's almost what makes it so much fun; it breaks the normal sugar work rules. Rose and pistachio work together like a dream too. Recipe written for Waitrose Weekend. Find my recipe here. 1. Preheat the oven to 170°C, gas mark 3, grease and line the base and sides of a 20cm loose-bottomed tin with baking parchment. 2. To make the cake, place the pistachios into a food processor and pulse for around 30 seconds until the nuts are the same texture as the ground almonds. Tip into a small bowl and add the ground almonds, polenta and baking powder. 3. Cream together the butter and sugar using an electric hand whisk until light and fluffy. Add the eggs one at a time, beating well between each addition. Stir in the dry ingredients and beat until smooth. Scrape the batter into the prepared tin and level the surface. Bake for 45-50 minutes until risen and firm. Test the cake using a skewer – it should come out clean when inserted into the centre. Leave to cool completely on a wire rack. The cake may sink slightly in the centre, but this is normal for polenta cakes. 4. While the cake is baking, make the crystallised pistachios. Place the sugar and 50ml of cold water into a small saucepan and bring to the boil. When the sugar syrup reaches 135°C on a sugar thermometer and it just starts to colour around the edges, remove from the heat and tip in the pistachios. Beat rapidly with a balloon whisk so the syrup crystallises around the pistachios, then tip onto a sheet of baking parchment to cool completely. When cool enough to handle, pull apart to separate the nuts. 5. To make the icing, combine the icing sugar and rose water in a small bowl with just enough water to make a thick icing. Drizzle all over the cooled cake, then roughly chop the crystallised pistachios and sprinkle over the top with a few rose petals before serving. Easter highlights our love of chocolate as a nation. I adore baking with chocolate, so it creates some fun baking challenges for me. However, dried fruits also pop up from their post-festive slumber have their moment at Easter, appearing in everything from hot cross buns to simnel cakes. I, like many other young people, am not a fruitcake fan. There is nothing quite as disappointing as biting into a 'chocolate chip' cookie and finding that the chocolate is actually a chewy, slightly bitter raisin. So deceptive. Dried fruit has its place if it is properly soaked in delicious things like tea or rum and made the star, but so often it is found mashed into overbaked fruitcakes or scattered limply over flapjack in a bid to make them look healthy. Well, I say no to this, and hello to chocolate simnel cake. You won't find a single currant in sight, and in its place is a decadent and dense chocolate cake, smothered in chocolate ganache and topped with chocolate covered marzipan balls. Some say you can't beat a classic, but I think that *sometimes* you can. 1. Preheat the oven to 170ºC, gas mark 3 and then grease and line the base and sides of a 20cm round tin with baking parchment. Place the plain flour, sugar, cocoa powder, bicarbonate of soda and salt into a large bowl, then stir to combine. 2. Melt the chocolate and butter together in a heatproof bowl over a small saucepan of boiling water or in the microwave until smooth, then remove from the heat and stir in the buttermilk followed by the beaten eggs. Pour the wet mixture into the dry ingredients, whisking until a smooth batter has formed. Spread the batter into the prepared tin, smoothing the top with a spatula. 3. Bake for 50-55 minutes until risen and a skewer inserted to the centre comes out clean. Leave to cool in the tin for 30 minutes before turning out onto a cooling rack to cool completely. 4. To make the marzipan truffles, roll the marzipan into 11 equal-sized balls and prepare a sheet of baking parchment. Melt the chocolate in the microwave or in a bowl over simmering water, then use a fork and spoon to dip the marzipan balls into the chocolate and coat completely. Transfer to the baking parchment and leave to set at room temperature. 5. To make the ganache, finely chop the dark chocolate and place into a bowl. Heat the cream in a small saucepan until steaming, then pour the cream over the chocolate and stir until completely combined. If there are any lumps in your ganache, microwave in short bursts, stirring often, until they have melted. Allow to cool for 10 minutes at room temperature. 6. Slice the cool cake in half using a serrated knife and place the bottom half onto a cake stand or serving plate. Spread half the ganache over the bottom layer and place the final layer onto the top. Cover with the remaining ganache and then arrange the marzipan truffles around the top edge. This is one dreamy cake. I created this recipe for Valentine's Day because the swirly pink icing and heart of rhubarb and custard sweets is pretty romantic (in my opinion). The sponge and icing is flavoured with custard, sandwiched with a rhubarb jam. It's easy to create this impressive looking cake - if you can make a victoria sponge you can make this with no problems. Find the recipe here or on the Waitrose website (link at the bottom of the page). 1. Preheat the oven to 180°C, gas mark 4, and grease and line the bases of three 18cm cake tins with baking parchment. 2. Using a hand-held electric whisk or a stand mixer, cream together the butter and sugar until really light and fluffy. Add the eggs one at a time, whisking after each addition. 3. In a small bowl, combine the flour, baking powder and custard powder. Add these dry ingredients into the egg mixture a few tablespoons at a time, and continue to mix until a smooth batter forms. Pour in the milk and mix again. 4. Divide the mixture between the three tins, and use a spatula to smooth over the tops. Bake for 25-30 minutes, or until golden and well risen. A skewer inserted into the centre should come out clean. Allow to cool briefly in the tins before turning out onto a wire rack to cool completely. 5. For the buttercream, beat the softened butter and icing sugar using a hand-held electric whisk or stand mixer until it forms a smooth paste. Add the custard powder and the milk, then beat on a high speed for 3-4 minutes until light, fluffy and pale in colour. Spoon ¼ of the buttercream into a separate bowl and add enough pink food colouring to match the pink section of one of the rhubarb and custard sweets. Add yellow food colouring to the remaining buttercream to match the yellow section of the sweet. 6. To assemble the cake, stack the bottom 2 layers of sponge on top of each other, and use a circular 10cm cutter to remove the middle. Press through both layers at once to make sure the holes line up. 7. Place one of the cut rings on a cake stand and cover the top with a layer of yellow buttercream using a palette knife. Spread a generous amount of the rhubarb jam on top of the icing. Try not to get icing or jam too close to the middle because moisture on the sweets will cause them to become sticky. 8. Put the second cut ring on top of the first and fill the cavity with rhubarb and custard sweets, reserving 2-3 for decorating. Make sure the hole is filled to the same level as the sponge or the top sponge will cave in. Apply buttercream and jam to the top and place on the final sponge. Thinly cover the whole cake with a little more of the yellow buttercream to trap any crumbs, then chill for at least 30 minutes. 9. Use a palette knife to apply some more of the yellow icing to the top of the cake and blend it over the edges to create a smooth top. Take both colours of icing and apply random splodges to the sides of the cake, swirling them around with the tip of a palette knife. Keep adding each colour until you’re happy with the finish – it should be like choppy water. Crush the reserved sweets and sprinkle around the top edge of the cake. It is best to eat the finished product on the day it is assembled or the sweets will stick together inside. For #FairtradeFortnight, this cake celebrates not just one but four glorious fairtrade ingredients. It's a quick and easy cake, perfect for rainy days and urgent late night baking for cake sales and cake rotas! What better way to celebrate Mother's Day than with a stunning classic cake? Coffee and walnut cake is one of my all time favourites - I love the bitter flavour of coffee with the creaminess of walnut. I've added in white chocolate to add a sweetness which works really well, and it makes a beautiful brittle to arrange on the top. I'm often disappointed in those coffee and walnut cakes you can buy that don't actually taste of coffee. Coffee is a strong, punchy flavour that deserves to be glorified in a cake, not to fade into the background. You won't have that problem here. My sponge recipe is rich in coffee and dark brown sugar, so you get a real coffee hit in every slice. Click the photo or title to be taken to the recipe. This is a full on cake for the most extreme Creme Egg lovers. It's got it all: chocolate ganache, drizzly creme egg icing, 3 layers of buttery sponge and a hidden centre of mini Creme Eggs. What's not to love? I've been working with Cadbury to create some delicious recipes, all based on the nation's favourite Easter treat. Creme Egg is such a fun brand to work with, and I've been able to fully immerse myself in it's crazy world by visiting the Creme de la Creme Egg Cafe in London a few times (check it out - it's got an adult ball pit and everything!). I recently ran a workshop in the cafe, showing a group of bloggers how to make my Creme Egg Drizzle Cake with varying degrees of success! All tasted fantastic though, and we all left on a sugar high from Creme Egg toasties and chocolate goodies. This cake is a lot easier than it looks - and perfect for the weeks leading up to Easter. If you want to go into a Creme Egg coma, then look no further, this cake is for you. To make the icing, divide the icing sugar between two small bowls and add 1-2 teaspoons of water to each. You might need to add a little more water – you want a thick paste to drizzle. Add enough orange/ white food colouring to the bowls to make your icing and drizzle over the cake. Finish off the cake by cutting open your Creme Egg and placing it on the top of the cake. Watch egg-spert baker Martha Collison show you how to re-create one of her brand new, oh-so-simple Cadbury Creme Egg recipes. This one's the never-seen-before G-oozing Creme Egg Pinata Cake - moist vanilla sponge cake filled with mini Creme Eggs, covered in chocolate ganache and topped with a g-oozing Creme Egg.